Theoxenia Hotel is centrally located, in the Via d’ Oro street with numerous jewellery and crystal shops, in walking distance to the restaurants, bars, shops and nightlife. The hotel has 9 rooms which have been built in traditional Cycladic style, offering luxury with a personalized and modern touch to meet all your day to day comforts. 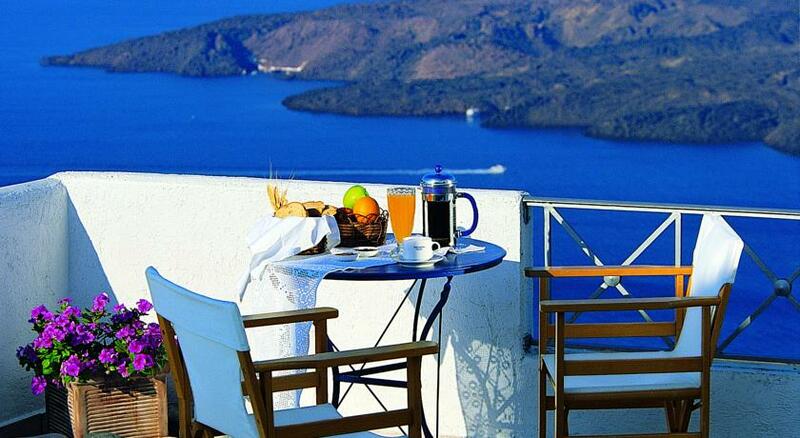 The superior rooms are privileged with view to the caldera and volcano, either from your window or the balcony. The standard rooms have balconies overlooking the famous jewellery street and the parade of people walking in the traditional cobbled paths of Fira. The Hot Tub Jacuzzi on the top terrace is a real getaway from reality, enjoy a refreshing bubble bath with views to the Volcano and the amazing sunset. 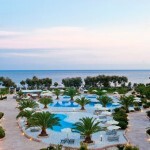 Theoxenia hotel is open all year round. Hotel Facilities: Reception, air conditioning throughout, fax service, internet access, American breakfast served in rooms or terraces, and Outdoor Jacuzzi for 6 pax. Guests can use the swimming pool at the sister hotel Aressana only 100m away. Room Facilities: Air conditioning, satellite TV, music, mini bar, wireless internet access, double glazed windows & doors, direct dial phone, safe box, hair dryer, private bathroom with Jacuzzi bathtub, some Superior rooms with Jacuzzi bathtub, balcony or veranda, and honeymooners can enjoy a complimentary bottle of wine & flower decoration.